STORY: Hundreds of Jet’s employees marched from the airport to the airline’s headquarters in India’s financial capital Mumbai to seek clarity on whether they will get paid soon and if their jobs will be secure over the coming months. The carrier, saddled with more than $1.2 billion of debt, has had to ground more than 80 percent of its fleet over unpaid dues to leasing companies, pushing it to the brink of shutdown and jeopardising hopes of attracting a new investor. Employees took out the march with banners and raised slogans against the company’s management. “Basically we want a clearance, a clarity towards what is happening with the management because the management is ultimately getting their salaries and their job is secured; but what about us”, said one employee, Manjula. The airline had suspended all west-bound international flights until Monday. 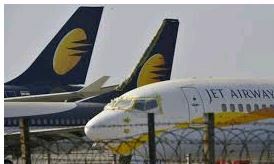 The airline, once India’s leading private carrier, has been forced in recent months to cancel hundreds of flights to dozens of destinations both in India and overseas, leading to a customer backlash and a steady slide in its market share.